Simply handing your smartphone to your child is a lazy way to keep them entertained; instead you can harness the incredible power in your pocket to enjoy quality time with your kids as they have fun and develop their creative skills. One of the best ways to do this is through augmented reality (AR), using your phone’s camera to superimpose digital images and animations onto the real world to distort reality. From unlocking the secrets of the universe to giving yourself a funny meerkat makeover, there’s loads of AR excitement to be had when stuck in even the most mundane of settings. Exciting and entertaining for little ones and big kids alike, these apps will turn your phone into a more magical portal than anything JK Rowling can conjure up. If you haven’t got the time to crack out the face paints, you can still customise your kid’s grinning visage easily and fuss-free using AR. Face-warping (where you fire up the front-facing camera and alter your features digitally) is one of the most fun and delightful things to do with your phone, and while there are a number of face-warping apps, MSQRD is one of the best we’ve seen. From ogres to tigers, and from fairies to fighter pilots, this app will transform your face (and those of your little ones) into all manner of weird and wonderful creations right before your eyes. Available for iOS, Android and Windows Phone, the app features an in-built face-switching tool to increase the fun of these interactive masks even further, offering truly odd features and bringing a swift smile to a child in any boring situation. If there’s one thing that every kid loves - besides chocolate or Santa - it’s dinosaurs. If you’ve run out of reasons for not taking them to Jurassic Park (because they know it’s real, no matter what you try to tell them), why not bring the prehistoric lizards to them? The great thing about this free iOS and Android app is it will drop AR dinosaurs wherever you point your phone’s camera, making everything from a walk in the park to a trip through the supermarket an exciting maze of dino-dodging. It has an useful educational element too, where tapping on the bodies of the virtual animals brings up a fact sheet on the beast. Including this surprising nugget: did you know the diplodocus was 33m long? Neither did we. Just because children are becoming used to a digital world, it doesn’t mean that the creative act of coloring-in needs to be forgotten. Quiver combines real-world drawing and shading with AR technology to bring the ancient art of shading to the modern era, using both physical skills and your phone’s camera. To start, you’ll need to download and print Quiver’s coloring pages from quivervision.com, add the app to your phone and use whatever pens or pencils you have to hand to transform your designs into colorful creations. Now when you dangle your phone over the pictures, your designs will rise from the page to bring the characters to life. As well as paid-for print outs, there are dozens of free designs to download and enjoy from Quiver to fire your child’s (or your) imagination. The idea of being Iron Man isn’t just exciting to children - it’s a cool idea that we can all get on board with. Well thanks to the power of AR, your phone can now get you pretty close to taking on that iconic role. OK, so you can’t fly around, be effortlessly suave or have billions in the bank, but you can get an idea of what it’s like cram your head into that superhero suit. 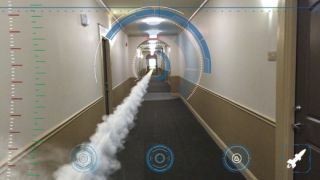 Using the Iron HUD app, you’ll hold up the phone to view the world through Iron Man’s eyes - all the while being guided by the voice of his assistant Jarvis. The free app is pretty basic, but splash for the in-app purchase on the all-encompassing in-app purchase, and you’ll soon be firing rockets, lasers and enjoying target-based mini-games. When you’re stuck inside with bored offspring on rainy afternoons, you can use AR to bring all manner of games to life, no matter how much space you’ve got available. It can be hard to choose which one though; there are AR football and basketball games out there, but we’ve found these just don’t work consistently enough to create a fluid and immersive experience. However, the iPhone-friendly Reality Pool brings a pool table to your house without any worries over space and cost. All you’ve got to do is place a rectangular item on a flat surface - a piece of paper, cereal box or rug will all work. Now when you point your phone in the direction of said rectangle a digital pool table will appear through your screen, and all you need to do is walk around it, line up your shots (pulling back the on-screen cue to make your pots) and turn a meaningless four-sided shape into hours of fun.